A ship’s passenger on the Great Lakes became alarmed as the ship passed near a rocky shore. Fearing that rocks were hidden beneath the surface, she approached the captain. “Do you know where all the dangerous rocks are?” she demanded. 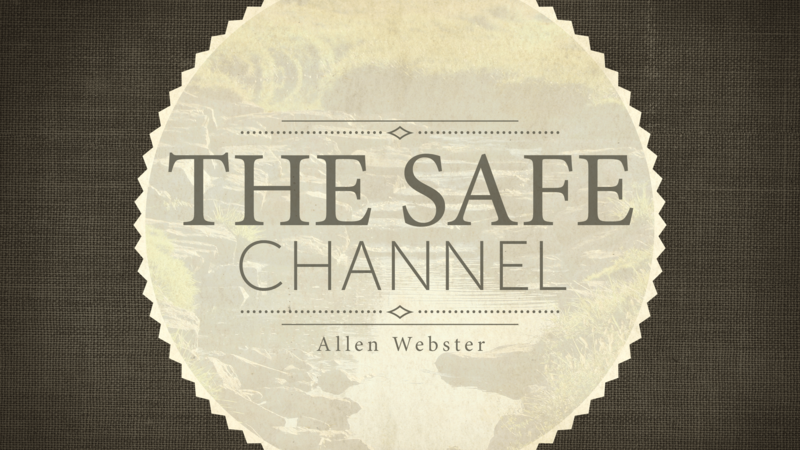 Likewise, we need to find the safe channel in religion, put ourselves in it, and stay there. The New Testament reveals this path (John 14:6; 2 Timothy 3:16–17). Others build their hopes on the ever-shifting sands of popular opinion, men’s wisdom, and the creeds created by religious leaders, but churches of Christ aim to stay within the safe channel of clear Bible teaching. “The disciples were first called Christians in Antioch” (Acts 11:26). “Agrippa said to Paul, ‘You almost persuade me to become a Christian’” (Acts 26:28). “Yet if anyone suffers as a Christian, let him not be ashamed, but let him glorify God in this matter” (1 Peter 4:16). Therefore, we call ourselves “Christians.” Others take chances on calling themselves after the names of men or methods. Some try to become “hyphenated Christians” inserting an adjective to describe the kind of Christian they claim to be. That is not found in the Bible, therefore it is not safe (cf. 1 Corinthians 1:10–13). The Plan of Salvation We Teach Is a Safe One. In the New Testament, sinners were told to believe and be baptized (Mark 16:16) and repent and be baptized (Acts 2:38). Candidates made the good confession after hearing the gospel preached (Acts 8:36–38). We know that it is safe to do the same things to obtain salvation, so that is all we require. Others gamble that they can be saved by “faith alone, before and without water baptism.” Some insist on a personal experience with the Holy Spirit. Many feel that leading a good moral life is plan of salvation enough. All should unite under the safe, undisputable plan. The Worship We Practice Is Safe.To study, pray, sing, give, and partake of the Lord’s supper is within the bounds of revelation. We read of early Christians doing these things. “And they continued steadfastly in the apostles’ doctrine [teaching] and fellowship [including giving], in the breaking of bread [the Lord’s supper] and in prayers” (Acts 2:42. Paul commanded Christians to teach and admonish one another with spiritual songs (Colossians 3:16). Many venture out of the bounds of Scripture by changing God’s formula for worship (cf. 2 John 1:9–11). Some add to worship such activities as testifying, choirs, solos, and entertainment. Most want to add instruments of music to the singing. Some take the Lord’s supper only once a quarter or once a year. All should practice scriptural and safe worship. The Church Organization We Use Is Safe. Churches of Christ are autonomously organized under King Jesus with elders, deacons, evangelists, and members. This was the practice of the early church. Paul mentions all four in one verse: “Paul and Timothy, bondservants of Jesus Christ, To all the saints in Christ Jesus who are in Philippi, with the bishops and deacons” (Philippians 1:1). As to hierarchy, Christ is Head (Ephesians 1:22–23; Colossians 1:18); a group of elders (bishops, shepherds) serve under Him, ruling in one local church (Acts 20:17, 28; 1 Timothy 3:1–7; Titus 1:5–9; Hebrews 13:7, 17); deacons are special servants of the church who assist the elders primarily in physical matters (cf. Acts 6:1–6; 1 Timothy 3:8–13). Evangelists or preachers preach, teach, and spread the word (2 Timothy 4:2). Members assist in the work of the Lord as their talents and opportunities allow (Romans 12:3–8; Galatians 6:10). The Life We Lead Is a Safe One.Seeking to imitate Jesus in every aspect of daily living is safe. Being honest, kind, compassionate, fair, meek, humble and cheerful demonstrates the mind of Christ (Philippians 2:5). Refraining from lying, gossiping, murmuring, filthy speaking, and cursing, shows the mouth of Christ (1 Peter 2:22). Abstaining from fleshly lusts (alcohol, smoking, fornication, adultery, illegal drugs) follows the manner of Christ (1 Peter 2:11, 21). In short, we try to speak, dress, act, and think as the Bible reveals that the Lord did. Some say that “Jesus lived in a different world than we do, our new morality can be substituted for His.” They advocate social drinking, mixed swimming, immodest dress, homosexuality, and smoking. By so doing they stray from the safe channel into the rocky waters of situation ethics and political correctness. All should unite on the safe morality of Christ. Why gamble with your soul? If these beliefs and practices seem reasonable and scriptural to you, then make your salvation both sure and steadfast, and come practice safe Christianity as revealed in the New Testament of Christ.